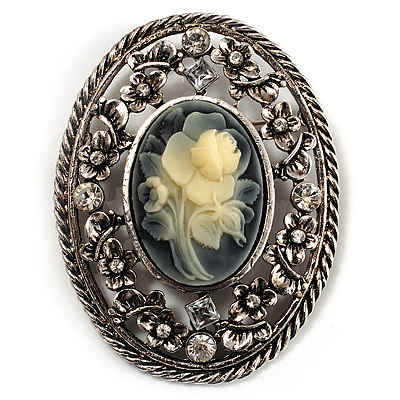 For a classic cameo lover, this Vintage Floral Crystal Cameo Brooch is the ticket. Featuring a romantic rose - shape flower crafted in the oval beige cornelian stone and set in the filigree crystal frame. The brooch made in antique silver finish offering a vintage look. It measures about 6cm x 4.8cm and fastens securely with a metal pin clasp. Cameo jewellery is truly classic and timeless in its appeal, so this stunning pin will make a great gift or give-a-way for Mothers Day. This cameo brooch can be twinned with the matching earrings and the ring to create a delightful combined set.